How to Instantly Change Windows 7 Password? Forgetting Windows 7 password is something that you don't allow yourself to do. However, things may frequently happen for this or that reason. Good thing is that actually you can change Windows 7 password with certain ways. Therefore, don't make this kind of annoyance to let you down. Here, check some ways on how to change Windows 7 password if you lost Windows 7 password. It is not difficult to reset Windows 7 password through the administrator account of the computer. So just contact the administrator and require him to change Windows 7 password for you. However, what if the administrator password was lost? Don't panic, check out the next steps. Windows 7 Password Recovery is an efficient utility to reset Windows 7 local and administrator passwords without any data loss even though you lost the administrator password. It will be the ultimate solution for Windows users especially those computer novices. Follow the step-by-step directions to learn how to operate it. a. Here you need another computer to download&install&run Windows 7 Password Changer, so this computer can access to system as administrator. b. On the main interface, you need to choose to reset password for local account. c. Insert CD or USB to your computer, and select the corresponding device. d. Simply click on "burn" to start burning this password reset disk. a. Insert the CD to CD-ROM Drive on the computer you can't access to and boot it with it. b. You will get into the main interface of Windows 7 Password Changer. Select the system installation you desire. c. Just highlight the user account and click "reset" and "Yes", the password will be removed instantly. d. Restart your computer by clicking "reboot". Forgetting Windows 7 password is not the end of your computer. 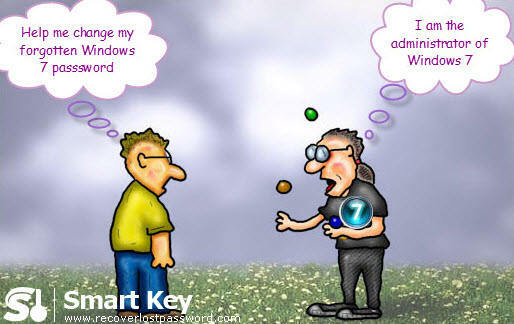 There is always a way to change Windows 7 password suitable for you. Good Luck!